Made with a pair of recycled vintage ladies Watch Movements. These movements measure 15x13mm in length and have a slight textured finish. The watch movements are securely attached to a pair of silver plated cufflink backs. These quirky cufflinks are made in the Steampunk style, using upcycled vintage ladies watch movements in different shapes and sizes. 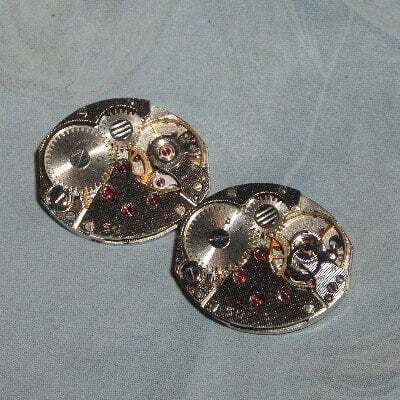 All the working parts can be seen on the front of the cufflinks including balance wheels, cogs, springs and jewels. These cufflinks are very unique and make stylish gifts. Perfect for a Bridegroom, Best Man or Usher, Businessman, Dad, Boyfriend, Uncle, Watch enthusiast, Steampunk fan or Gadget lover. Wonderful for Birthdays, Anniversaries, Christmas, Valentines Day or Fathers Day. Please allow up to 2 working days for dispatch as each pair of cufflinks are handmade to order.